Breeches are still worn as livery for special occasions in several European courts. Here, a coachman in the Netherlands wears them during Prinsjesdag, 2013. Breeches (/ˈbrɪtʃɪz, ˈbriː-/ BRITCH-iz, BREE-chiz) are an article of clothing covering the body from the waist down, with separate coverings for each leg, usually stopping just below the knee, though in some cases reaching to the ankles. 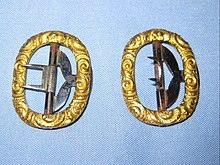 The breeches were normally closed and fastened about the leg, along its open seams at varied lengths, and to the knee, by either buttons or by a drawstring, or by one or more straps and buckle or brooches. Formerly a standard item of Western men's clothing, they had fallen out of use by the mid-19th century in favour of trousers. 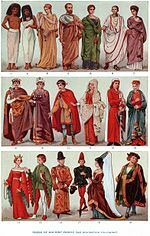 Modern athletic garments used for English riding and fencing, although called breeches or britches, differ from breeches in ways discussed below. 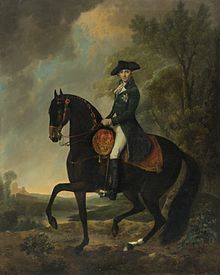 Breeches is a double plural known since c. 1205, from Old English brēc, the plural of brōc "garment for the legs and trunk", from the Proto-Germanic word *brōk-, plural *brōkiz whence also the Old Norse word brók, which shows up in the epithet of the Viking king Ragnar Loðbrók, Ragnar "Hairy-breeches". 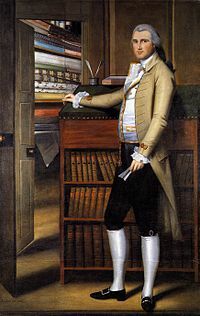 Like other words for similar garments (e.g., pants, knickers, and shorts) the word breeches has been applied to both outer garments and undergarments. Breeches uses a plural form to reflect it has two legs; the word has no singular form (it is a plurale tantum). This construction is common in English and Italian (brache, plural of the never used braca), but is no longer common in some other languages in which it was once common; e.g., the parallel modern Dutch: broek. Until around the end of the 19th century (but later in some places), small boys wore special forms of dresses until they were "breeched", or given the adult male styles of clothes, at about the age of 6 to 8 (the age fell slowly to perhaps 3). Male and female children's styles were distinguished by chest and collar, as well as other aspects of attire, such as hairstyle. Vráka (Greek: βράκα) are the traditional breeches of the islands of Greece from the westernmost Ionian Islands to the easternmost, Cyprus, as well as coasts of South mainland. Greek breeches are extremely roomy and are meant to be tucked inside long boots just below the knee. They were originally meant to facilitate movement on fishing boats and sailing ships. They are usually accompanied by a long, wide piece of cloth turned many times around the natural waist as a belt. As the vráka lacks pockets, items (such as money) are stored inside the folds of this belt. Vrákes are usually made of sturdy cotton double cloth, usually dark blue or black, with brighter color cloth used as the belt. They were usually worn with white, long-sleeved shirts and a roomy waistcoat. 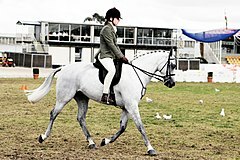 2005 Melbourne show competitor in jodhpurs. Fencing breeches are worn in the sport of fencing to permit fencers to extend their legs more than they could wearing normal jogging trousers or tracksuit bottoms. Fencing breeches are also used as protective clothing for the legs.